We like to dig. We have a couple different areas at our house that we get to run around in. The area just off of our deck is where we spend most of our time. After we dig holes there, our Human will often refill our holes with the dirt that we so delicately removed. Can you believe that?! She does not always give our work the respect it deserves. The above photo was taken in the other area that we get to run around in and dig in. 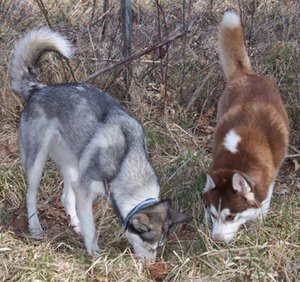 That's Aurora and me sniffing before digging. My human never goes refills our holes there. Get this, under the dirt there are these things called moles that have tunnels! I've never seen one, but Meepie said that he's killed one before. I killed a mouse once. I put my paw on it GENTLY and it just keeled over and died. That stupid Lex once brought a dead opossum into the house at 2 in the morning. Our human was not happy about that! those mice are a bit touchy when you paw at them lightly. I alway wonder why they stop moving when I'm ready to keep playing. What a great pile of fur in your last post. I get that much this time of year too! Hi Cal. Mice are stupid. One morning our human woke up and found one dead in her toilet. That stupid mouse should have known that was my drinking fountain! I didn't kill an opossum but I chased one up a tree at 2 in the morning (We Huskies do our best work at 2 am). I sat there and barked at it, hoping that my loud bark would make him fall off. The whole neighborhood was not amused. Something about having to go to work in the morning. Well, me too. It was 2 in the morning, and I was WORKING. People! We are members of the Working Dog group, afterall! (My verification word this time looks like a weird misspelling of "opossum." It's "oqooswkm."